My friend who also had one of the SSP's here sent me some pictures of our cars that he had. His was silver with opal gray interior. It was an automatic with the same basic options as mine. At the time of these pictures we had both opted for pony rims, and you can tell I had just bought my house as I had no grass yet. He sold his too in about 2000 or 2001. I would love to find his old car. Here are the pictures he sent me. Fantastic Car!! That Royal Blue is a very rare color on a coupe to begin with and then combine it with the SSP package....Awesome car!! Please find attached the two photos I mentioned in yesterday's email. Couldn't attach them there. Sorry for the photo quality. Didn't own a digital back then. The photos were taken in 1986, during our annual pilgrimage to your Islands, at a City garage somewhere near Waikiki, I think. It has the silver door lock bezels of a SSP but not the "black out" wheels. When I returned to the mainland I called a Engineer buddy of mine in Dearborn who called his buddy over in the SSP Office to ask "where's the black wheels". 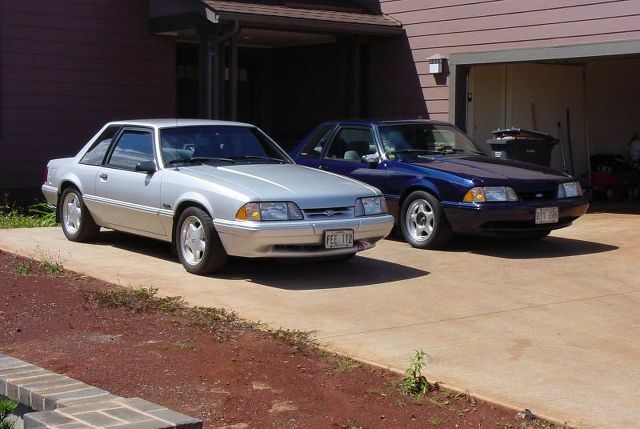 The SSP guy did some research and replied "we haven't sold a SSP Mustang to Honolulu". So I don't know if it was City owned or local dealer supplied/ loaned as a "test" vehicle or Officer Owned (and marked up). I do notice now that the car does not display a Unit number. There wasn't anyone around to ask while there and I was afraid to walk any further into the garage without permission. My Badge, from another State, may not have helped me too much if I got stopped. Maybe you can shed some light on this car if you were around back then, if you have time. 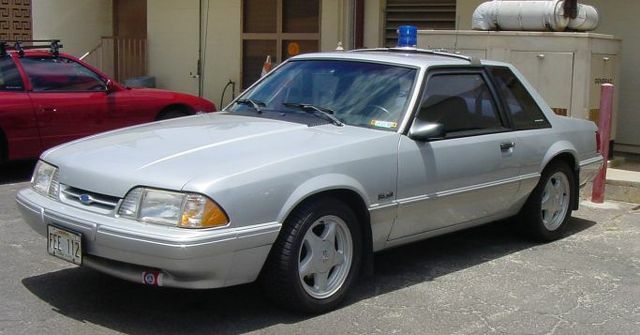 I also remember that it seemed 5.0 Police units were everywhere back then. In fact I have a photo somewhere of a Police Mustang that has a Rental Mustang (5.0/ convertible) on a traffic stop on the saddle road on the Big Island. Still searching for that one. Hope both you and your Mustang are doing well! Probably not an SSP with those wheels.